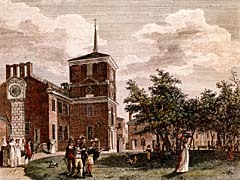 click image for close-up William Russell Birch's idyllic engraving of the back of the Pennsylvania State House hints at the diversity of race and class that typified Philadelphia at the turn of the 19th century. Well-dressed white men and women stand in groups or stroll the grounds, while four Indian men, some in traditional dress, appear to debate some course of action. The image was included in a collection of engravings of important streets and buildings, called "Views of Philadelphia." Birch was an English engraver and miniaturist who published the book with his son, Thomas in 1800. In 1794, five years before Birch drew this scene, Richard Allen purchased an abandoned blacksmith shop that stood a block from the State House and had it hauled to Sixth Street, where it was refurbished as the Bethel African Methodist Episcopal Church.